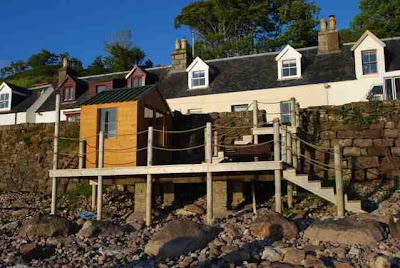 "I saw quite a few nifty sheds including some sweet little sheds built right on the beach at Applecross with little decks for watching the sunset - not beach huts, real kit sheds - very sweet and one or two very nicely done." While Shedworking is as much about homeworking as about garden offices (ok, nearly as much), we sometimes have a tendency to get carried away with the architectural side of shedworking as opposed to the actual business side of it. Enterprise Nation, which does a cracking job of supporting home businesses around the UK and generally promoting the home business cause, has a couple of very interesting interviews with very successful companies operating from their back garden shed. "Building our office was one of our best decisions ever. The build was smooth and Paul, the carpenter, fell in love with Saffron Walden and our garden in the process. Timber framed, double glazed wooden windows, oak floors and oceans of lambs wool insulating us..it really is the business! The space is fantastic to work in . Light, bright, warm, a view from every window…sometime I wonder if we are watching the wildlife, or if they are watching us and dreaming of a second home in warmer climes. We have space for visiting developers and sub-agents to work on their flying visits- but for the most part we are lucky enough to have this office all to ourselves." Find out more about Each Property Med here. 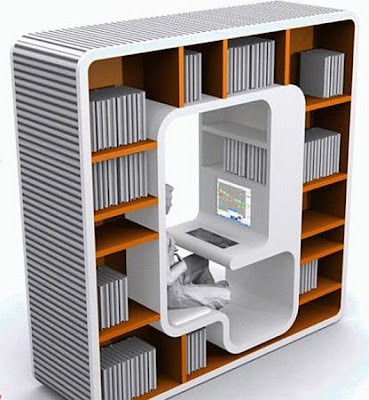 We've covered lots of booths and home office pods for use inside the home rather than as a strictly garden office - here's another, the rotating (we love it already) 360 from FAK3. It was built for a client who wanted a multifunctional central space for eating, working and having fun. 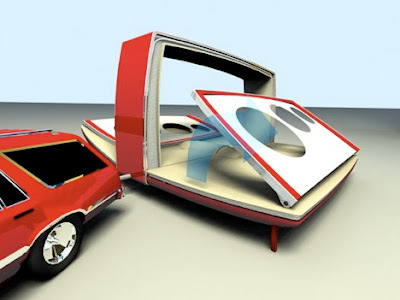 So it houses a keyboard as well as a desk and a television. Apparently the industrial strength bearings can support up to two tonnes and you can make the whole thing revolve at the touch of a button. As FAK3 say: "Its off-centred axis means as the cabinet moves, its content and form shifts the room’s perceived spatial configuration to give each zone its own character." Lovely. Congratulations to our 1,000th subscriber! I'd like to say a big thank you to all our subscribers, especially to those who have been with us for a while (in some cases years) and missed out on the chance to win a prize in the recent subscriber competition - I'm hoping to be able to offer you all something next year as a little token of gratitude and will let you know once I've sorted it all out. In the meantime, welcome to all the new subscribers who have joined in recent weeks and pushed Shedworking above the thousand mark for the first time. 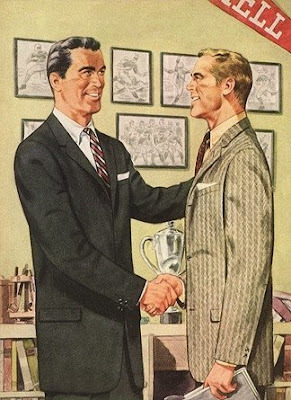 Above is an artist's impression of me congratulating Ian MacLeod on his fine achievement of being number 1,000. The box of sheddish books will be winging its way to him soon. Shedworking at 10 Downing Street? "The house is eerily quiet. Lots of staff are on holiday, but the gardener is here doing magnificent work"
Sue Guiney happily splits her time between London and Martha’s Vineyard: her poetry play, Dreams of May, was premiered in London’s Pentameters Theatre and her first novel, Tangled Roots, was published in May by bluechrome. 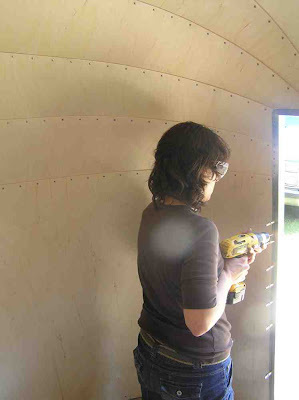 She blogs and she is also a shedworker. 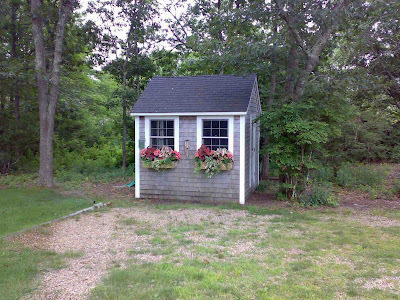 Sue very kindly agreed to write about her shedworking atmosphere in Martha's Vineyard. About seven years ago, my husband and I built a house in a wooded clearing on Martha’s Vineyard where we have been spending summers for decades. It is our dream house, and surrounding it after years of work and planning (and help!) are our dream gardens. That parenthetical help comes from a terrific group of gardeners, all of whom are, for some reason, young, tan, blonde, beautiful women. A few years back, the chief beautiful woman looked at my husband with her gorgeous green eyes and said, “It would be great if we could have a garden shed.” Immediately, he set to work. But when I heard about his plans, I had the only possible reaction, namely to say “What am I? Mashed potatoes? The shed was due to be a 10-‘x10’ one room building, with a sloped roof that matches the house, and two front windows. But instead there is now a huge difference. We dropped a wall down the middle of the single room, creating two equal 5’x10’ spaces – one for them, one for me. 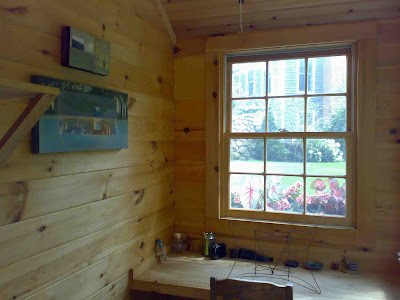 This is my “Writing Shack” – the most simple, easy, basic space possible, and I love it. 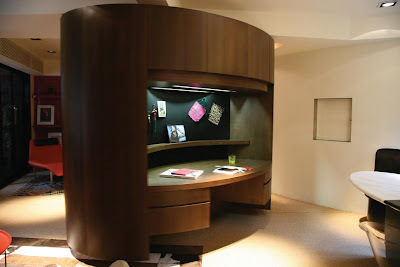 Against one wall is a built-in desk (actually, a tabletop without drawers). On another wall is a bookshelf (although any books I leave in there become mildewy and gross). There is electricity and a lightbulb hanging from the ceiling. I like to think of it as simple and elegant. But I have filled it with rocks and shells and pieces of driftwood from the local beaches. A bud vase, a model of a reclining Buddha, a desk chair, a small rocker with a fish-shaped foot stool, and a side table. On the wall are two paintings by a local artist called Kara Taylor, each of which has reminded me of the novel I have written/am writing in this very space. Summer is a very busy time for us here. There are often dinners for twelve, guests coming and going, dogs barking, children slamming doors, cars pulling up and driving away. But when I go into my “shack” I am transported to wherever I need to be, happily alone in my head, full of words and, if I’m lucky, the occasional line of poetry. 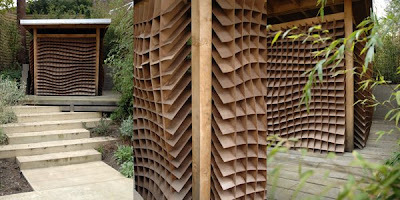 We featured Superblue's honeycomb shed a while back and Annick Collins has been in touch with news of their new garden retreat. "This garden building was developed for a new house in Hampstead. The retreat uses the honeycomb panels on three sides and sits within a green oak deck. The structure is a green oak pegged frame which is very durable and will last for many years, ageing to a silver grey finish." We've admired Laura Geary's shed on wheels from beginning to end, but here's something of interest from Shorpy, the 100 Year Old Photo Blog, writers Farrar and June Burn in 1929, with their sons North and South. Now that's the way to travel. Thanks to Jeff Nigrelli for the alert. The new issue of The Shed - number 15 - is now out. But times have changed and The Shed has changed with them. No longer simply available as a pdf, it is now a fully online e-mag (though there are one or two things to sort out before the next issue emerges) which you can read by simply clicking here. Navigation is pretty easy - click on a page to bring it into focus, click to the side of a page to move pages, or on the corner. If you have any problems, do contact me and I'll sort it all out. 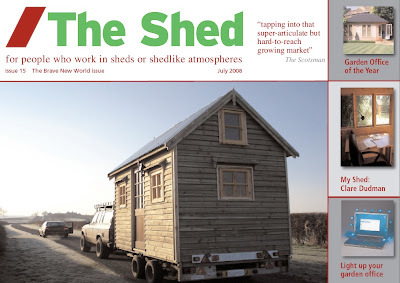 It's a great issue too with writer Clare Dudman featuring in the My Shed slot, Sarah Salway continuing her shed serial, Felix Bennett's marvellous View From A Shed and a new slot featuring readers' shed stories. You can read it online, download it as a pdf, and email a friend directly from the site to tell them all about it. Happy reading! 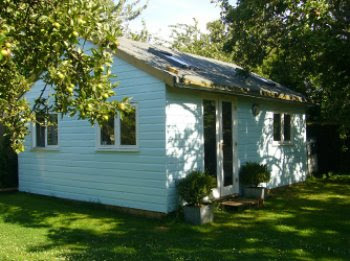 Normally when we think of garden offices we have a smallish building in mind. But of course size is no obstacle when it comes to running a business from your back garden. Christopher Middleton in The Guardian takes a look at music lovers who have big enough back gardens that they have built little concert halls in them. David and Mary Bowerman have a 160-seat concert hall 20m from their living room at their Champs Hill bungalow and recent headlining artists have included Dame Felicity Lott, Julian Lloyd Webber, and Sir Thomas Allen. Admirably, they ask for donations rather than charge for tickets. The article also features Douglas Paterson who built his 200-seater for just £50,000 and the Old Granary Studio run by Jill and Andrew Giller. Well worth a browse. First an admission. I don't actually own this book, largely on the basis of price since the cheapest copy on Abebooks of Hints on Ornamental Gardening: Consisting of A Series of Designs for Garden Buildings, Useful and Decorative Gates, Fences, Railings by John Buonarotti Papworth costs £800 and the most expensive docks in at £2,600. But it (or rather 'they', as it's really a two box set) sounds like a treat (a plate from the book is pictured above). "This is the rarest of Papworth's works following on the success of "Rural Residences". Within the context of Regency landscape architecture, Papworth proposes a variety of rural improvements which led to the "Picturesque" style of garden design, for which the English became famous." 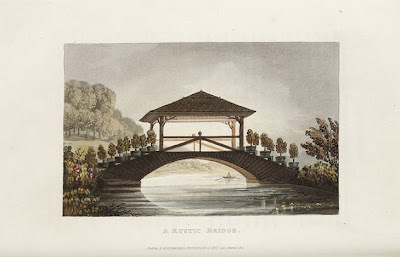 First published in 1818, it features 27 handcoloured aquatints and some marvellous designs including small cottages for estate workers with a garden, so that the "uncultivated mind of the husbandman" is kept occupied and out of the local "village alehouse", a fishing lodge, and an ice house. Papworth himself (1775-1847) was a busy British architect, landscape designer, artist, and furniture designer who also laid out the Montpellier and Lansdowne Estates of Cheltenham. "Each item on this list is off-the-shelf. Nothing fancy. No steep learning curve. No fancy bells and whistles to get in the way of reaching near peak productivity from jumpstreet. With so much to learn about business and living from aboard an RV, the last thing we needed was to learn a bunch of new technology." If Shedworking had an internet moment of the week slot, this post of Jeff's would be it. Well worth a browse for all the extra details. We mentioned the Garconnière at Houmas House in Darrow, Louisiana, some time ago but now Bill Alger from Houmas has sent in some more detailed and up to date photos. The garconierre we featured has been transformed into an office for the Houmas House historian, with a wing attached. The photos show the downstairs living room and the upstairs office. The conversion, carried out in 2007, also includes a bedroom, kitchen, dining area and bathroom. Tomorrow we'll feature a second garconierre on the property that has been transformed into a bar. We can send the winner every title or if you'd prefer mail them to individual addresses as presents with a pleasant card inside informing the lucky recipient of your benefaction. Many thanks to Emma Townshend for donating several of these prizes. 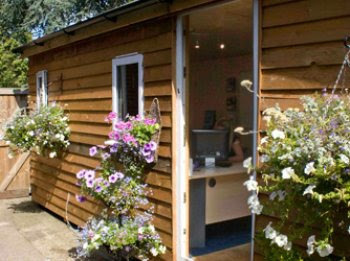 Was your garden office denied planning permission? If so, please email me as there's a nice person from a national UK newspaper who would like a word for an article she is writing on just this subject. The same person is also after a case study of someone who is growing their home business from kitchen table to garden office, ideally with a good photograph to go with it. It's not exactly the French version of Shedworking, but for anybody who enjoys this site, I'll bet my bottom Euro that you'll spend several happy hours whizzing around Les Cabanes, Le site spécialiste des cabanes en France. It obviously helps if your French is up to scratch but even if you're still stumped by the gender of a kitchen there are many, many fabulous shedlike atmospheres and photos liberally scattered around the site. If you do know the gender of a garden, then head for the forums or the sections on the environment, books and DIY. Along the way you'll find treehouses, yurts, beach huts and naturally lots of cabins, huts and sheds. Best place to go first is the cabanes section where you'll find, for example, La gentilhommière du Bois Adam pictured above. An English version is under construction. Thanks to Annie Leymarie for the alert. 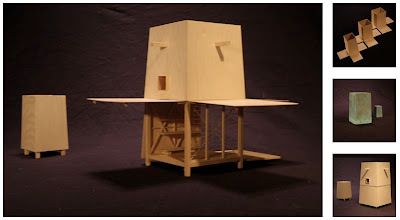 The always interesting Audrey Tempelsman from Dwell Blog asks why we like sheds so much. "Is it," she asks, "because they embody the no-more-than-you-need lifestyle that Blackberry-bound urbanites and eco-minded modernists long for?" That's certainly one answer. Her ponderings are aroused by the announcement of the results of the Australian Institute of Architects Small Project award. Among the commended projects was the rather attractive Permanent Camping, a 3x3m prefab by Casey Brown with copper-clad siding to fight off brush fires and lousy weather. 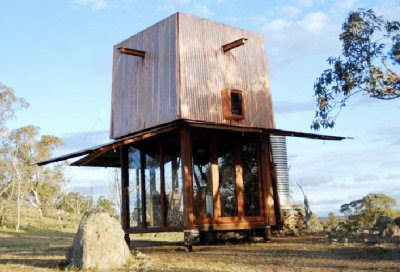 It has two folding sides, a sleeping loft, kitchen and a copper-clad outhouse. 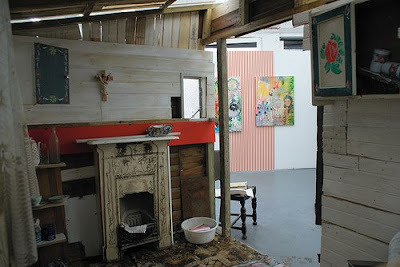 "Steve Bell works in a funky, cluttered studio, which seems precariously bolted to the side of his home in Brighton. Splashes of ink and vibrant watercolours decorate every surface. The wall in front of his workspace is papered with dozens of photographs of world leaders, celebrities and headline makers." If you're wondering where Shedworking's literary editor Sarah Salway has vanished off to, wonder no more. We mentioned the Tiny Circus project last month (a community arts project travelling around the USA in airstream trailers which you can donate a little something to here). Well, she's joined them for a bit and we'll be carrying a report of her experiences here on Shedworking when she returns. 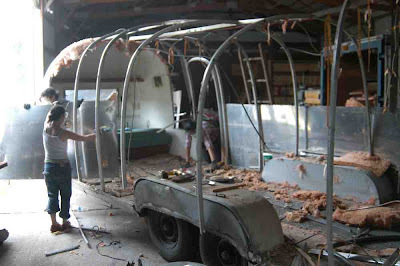 In the meantime, hop along to their blog to see some great photos of the airstreams being customised (such as the ones above and below, Greta doing some riveting). Orangeburg, N.Y. - A New York state report says a maintenance man who earned $100,000 last year working at a psychiatric center has been living for free in a paint shed on company grounds and even had his mail delivered there. A report issued Monday by the inspector general's office says the worker lived on the grounds of the Rockland Psychiatric Center in New York City's northern suburbs for three years. It says he stayed in a back room of the shed and had a couch, microwave and refrigerator. The center's executive director told inspectors he didn't know the worker was living in the shed. The worker is being charged $2,500 for the time he lived there. Now he's living with his wife at a home in Pearl River, about 3 miles away. From AP but reported everywhere. 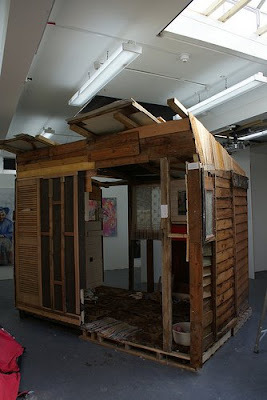 Pictured above is the Thomas Clarke house shed by Denis Gobo. 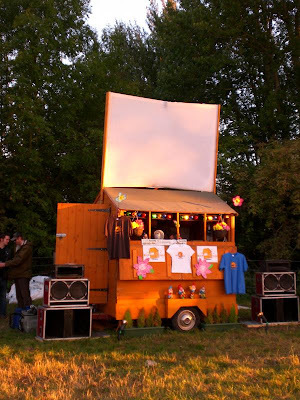 "takes the best elements of modern clubbing but disguises it amongst all the stuff you‘d find in your Dad’s old shed, to make a truly unique entertainment space and novel curiosity, guaranteed to intrigue & interest, amuse & amaze at all times. By day, chill out and enjoy the good-time garden party vibe, with classic garden games, and Jane Fonda workouts. Then dance the night away to top quality DJ sets, with a full light show and live visuals on the shed's giant rooftop screen." They'll next be performing at The Big Chill August 1, 2 and 3. Have a look around in the video below as Patrick is interviewed by Rufus Hound from BBC3 at the Reading Festival. And a quick search reveals that, naturally, it's also on readersheds.co.uk. More proof, if proof were needed, that planning permission is vital when building any kind of shedlike structure comes from Vancouver. 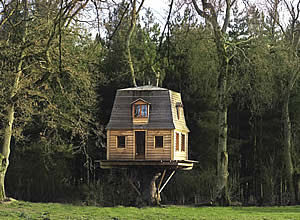 In brief, this 45 square foot wooden pirate ship tree house was built by an architect for his young sons. A neighbour complained (on grounds of privacy and outlook), a local planning officer agreed and, more importantly, earlier this week so did a judge who has ordered it must be taken down within 90 days. The whole thing has taken two years to sort out. More details in the Toronto Star and CBC Radio Canada: comments on the latter site are particularly worth reading. Thanks to Annie MacTavish for the alert. 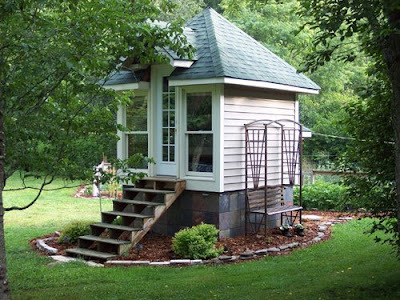 The Tiny House Blog is an absolute must for anybody interested in garden offices: though, as it says on the tin, Kent Griswold who runs the site concentrates on tiny houses, many of them have distinct shedlike tendencies. Here's a perfect recent example, pictured above, a shanty in North Carolina which follows on nicely from today's earlier post about living in your shed. 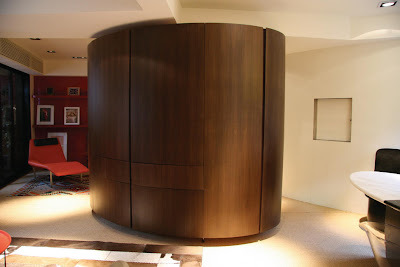 Built by Jeff, it's a mere 64 square feet though they've managed to squeeze in a lavatory and a Queen size bed. "It used to be just fairies that lived at the bottom of the garden but it seems the credit crunch has put paid even to that. Young couples unable to afford their own place are setting up home in glorified sheds in their parents' back gardens instead." 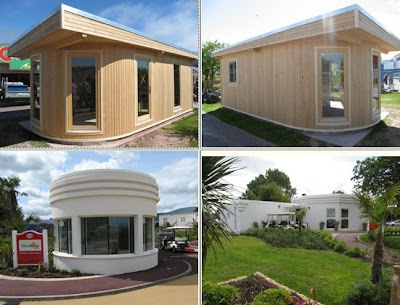 Bill Allen from Custom Timber Build (whose models are pictured above) is quoted as saying that sales in the chalets are booming among twentysomethings and that he anticipates a return to 1950s-style living when several generations of a family lived on a single plot of land. "The idea is that the sheep's idiosyncratic grazing patterns - some nibble bushes while others prefer chomping coarse terrain - will re-establish different levels of grass (good breeding ground for rare species), gradually replacing the aggressive approach of industrial mowing." 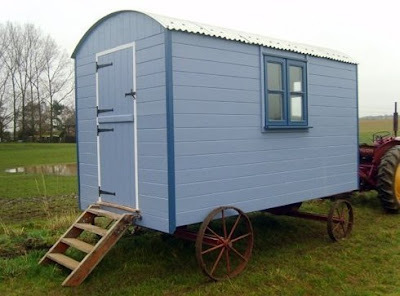 But of course what Shedworking wants to know is this - will we also be seeing the introduction of urban shepherds' huts too? Almost all writers are work-at-homers. Some, like me, write from an erstwhile bedroom-turned-home office. 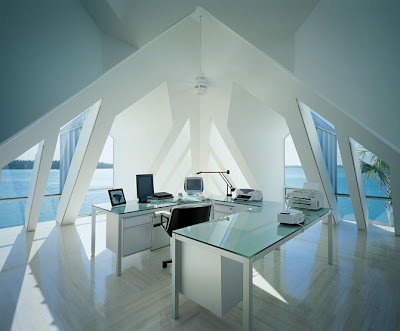 Others write from "alternative" spaces like garages, sheds, cabanas or other detached structures. Even teleworkers have their workspace. Henry David Thoreau took shedworking to a different place. Much as he may bemoan the complexity of a phrase that defines a simple workplace, consider him the father of the "alternative office." The 17th Century American poet, essayist and naturalist did some of his best writing from a cabin deep in the Central Massachusetts woods outside Concord. There, for two years, two months and two days, Thoreau essayed on the nature of the environment, civilization, and man's place amid the quickening pace of society. Visiting Walden Pond this month as part of Home Office Highway, I truly was moved by the path Thoreau trod (or sauntered, as he came to call his walks and which his followers in The Thoreau Society are fond of proclaiming), and how much my tour followed his lessons. The most striking observation I can offer from my last three weeks on the road conjure both the likeness and juxtaposition between my mobile RV office and Thoreau's cabin. Both provided about the same square footage of "working" space, though mine has been shared with family. Each offered exactly what the scribe needs to ply his trade. Thoreau had a desk, chair and writing instrument (pencil, I presume, given pencil making was the family business). 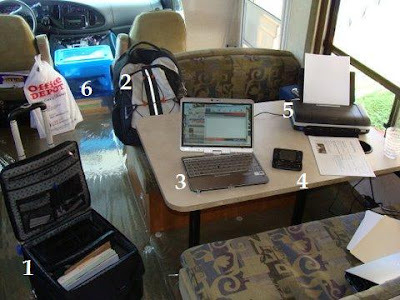 I have the dinette table and bench, my HP tablet notebook and Verizon broadband access card, and "cloud-based" software apps like Gmail and Twitter and Flickr that enable me to work from anywhere. Yet as we struggle and sweat to amass more stuff, Thoreau's words resound ever louder. "Simplify, simplify." If Thoreau's life's work can be summarized in a comment, it would be this. All that clamoring about 21-inch displays and uber-fast desktop workstations and Herman Miller Aeron chairs is all well and good. But as any deft writer or other professional will attest, tools don't make the tradesman. They may facilitate the process, but give me an RV, or a hotel room or a picnic table deep in the woods, and I have that place I need to work. All Thoreau needed was his cabin. And while only the replica remains, and sits about 500 yards from the original pond-front setting where Thoreau spent two of his 44 years, it remains an exalted lesson in the theory of simplicity, of efficiency, or the ability to do more, much more, with much more meaning – and with less. Not because you have to, but because you want to, you feel the need to, and because you can. "The really efficient laborer will be found not to crowd his day with work, but will saunter to his task surrounded by a wide halo of ease and leisure." That passage was written by Thoreau in the 1840s on the shores of Walden Pond. They live true today, whether your "cabin in the woods" is a shed in the backyard, a gazebo in a meadow, or an RV touring the American countryside. Those of you suffering from shepherds' hut withdrawal symptoms will be pleased with today's choice, Bedfordshire-based Pilgrims Forge who do indeed design and build shepherds' - and gamekeepers' - huts. Features include a full-size turntable for maximum stability, hand made wheels, pivoting axle with adjustable stops for levelling, and handforged ironmongery throughout. 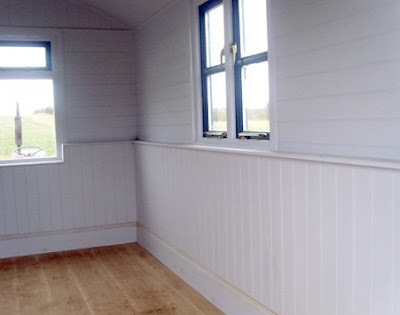 There's a choice of outside cladding (Douglas Fir, Oak, or corrugated tin sheet) and oak flooring. Options include insulation, stable or french door and iron wheels or inflatable tyres for road use.There's also an attractive photo gallery here. 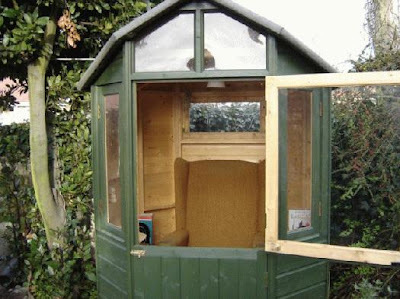 There are some excellent garden office and shed ads out there. 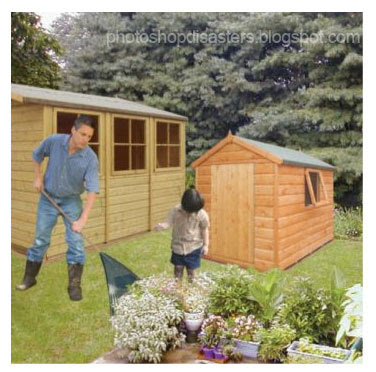 Sadly, this one from B&Q as highlighted at the marvellous Photoshop Disasters blog isn't among them. And as one of the commenters to the site points out, on the original photo you can zoom really close in. The Terrapin Narrow Gauge Society is a loose knit group of railroad modellers that has been meeting together in Southern California since 2000. With an emphasis on modeling narrow gauge, scales in the group run the gamut from HOn3 through to Gn15, and into 1.20.3. 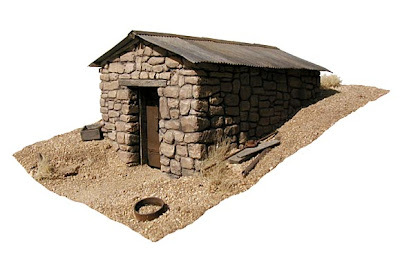 Most members however are 1/4 scale modelers, and that is the main scale of the group. Models range from freelance to prototypically correct, and everything in between. 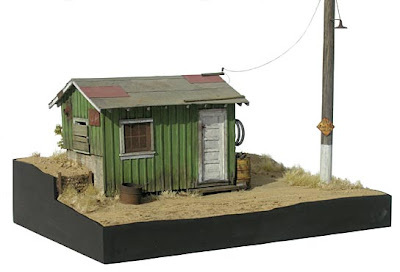 Dynamite Shed, Green Shack (both below) and Peeling Painted Corrugated Metal (above) by Marc Reusser. 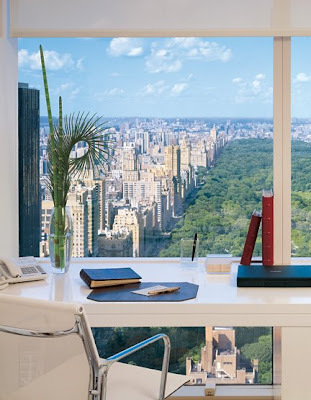 So just who does work from a garden office? 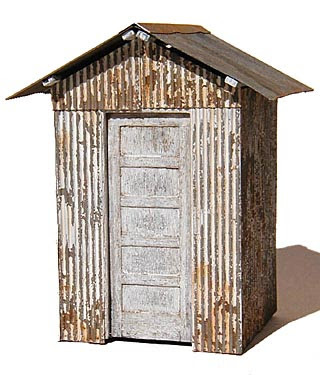 National Shed Week: What's top of your wish list?